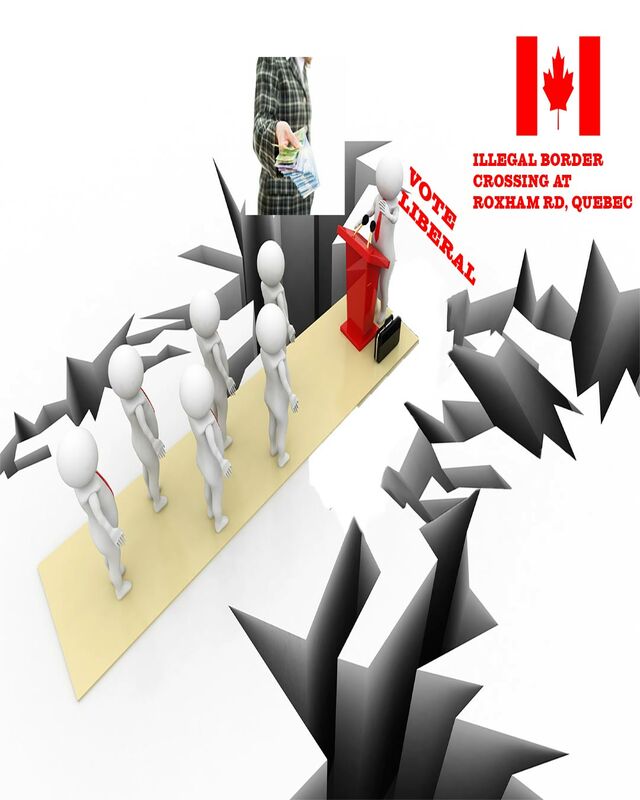 The illegal border crossing at Roxham Road is effectively a Canadian tax payer funded voting booth for the Liberals, with no exit in sight. The Liberals say their hands are tied to stop migrants from illegally entering the country because of international agreements. Since when was Canada controlled by unelected bureaucrats in some far off distant place? But there’s method in the backroom-bureaucrat-Trudeau madness. Like his father Pierre Trudeau before him, and the big money Democrats in the US, Justin Trudeau is using immigration as a political fund raiser to get out voters come election day. That’s tens of thousands of voters crossing at Roxham Road who are indebted to the Liberal government for allowing them to enter Canada illegally, and give them health care and access to lucrative amounts of other Canadian taxpayer resources. It is “craziness” (Alice Wong, June 5, 2018 in Question Period), but “crazy like backroom bureaucrat foxes” that the Liberals are dragging their heels on fixing the illegal border crossing. Ahmed Hussen, Liberal Minister of Immigration, did do some furious tap dancing yesterday deflecting from Ms. Wong’s questions on why the Liberals can’t stop illegals from entering Canada. We are a country for God’s sake. “Whereas Canada is founded upon principles that recognize the supremacy of God and the rule of law” is in our Canadian constitution. We are a country founded on the rule of law, but the leader of the country is saying it doesn’t have the jurisdiction to control the Canadian border, or at least put temporary measurers in place based on public safety? The facts are very murky. In contrast, the Brexit cards were on the table, and the UK voted on clear issues: do we want unelected bureaucrats in Belgium telling the UK how many and when immigrants would cross our borders. The Brits said “Uh, no. We are a country. We are a people with a long and proud history and culture. We like being British. We are a welcoming nation, but we will not hand over the keys to our home to Belgian bureaucrats who may choose to dilute us into non-existence. In Canada, the dealing is done under the table. We never get to see a clear picture, much less vote on it. The Canadian media provides blurry glimpses: Trudeau meeting with big Democrat funder George Soros, a champion of identity politics to get out the minority vote; snippets of incomprehensible information saying the Liberals can’t stop the illegal border crossing because it’s the US’s fault (what? ), and Stephen Harper’s fault (what? what?). It is crazy talk, but Canadians are used to crazy talk from Trudeaus. Justin is taking a page from the play book of his father and the US Democrats. Curiously, the government did not actively seek to attract people with job skills..…Contrary to [Pierre] Trudeau’s lofty pronouncements about fairness, his government did not spend this money ending discrimination and inequality, but funding folk dances, festivals, language training and songfests. And Liberal party strategists quickly clued in that the recipients of all that cash might well return the favour at election time. At least that explains Justin Trudeau’s affinity for dressing-up and dancing. Update: October 5, 2018. “Asylum seekers” who entered Canada and have not been processed(not Canadians), are being urged to vote in the upcoming October 2019 election. This may also explain PM Trudeau’s demands to have “illegal” migrants entering Canada illegally be referred to as “irregular”. It may also explain Trudeau’s refusal to fix the illegal border crossing. The Liberals have regularly called Canadians “racist” for using the word “illegal” to describe “illegal migrants”. It was also revealed earlier this week that the word “illegal” was being quietly replaced with the word “irregular” on Canadian government websites. This entry was posted in Immigration, Liberalism-Socialism-Communism, Politics, Canada, Think Over News and tagged Brexit, canada, identity politicis, illegal immigration, Liberals, roxham road.